Inside Lexcorp towers, a chubby blonde man named Ed shows off the Superman symbol taped to his chest.�The rest of the employees just ignore Ed as he asks them all who he is.�To give them a hint, he runs to an open elevator shaft and dives in.�The panicked workers rush to the open door, but they find Ed holding on to a service ladder, grinning widely. Inside the boss' office, Ed is yelled at for his behavior.�Lexcorp will not tolerate his antics.�However, at that moment Ed's supervisor comes into the room and calls the boss outside.�He pleads Ed's case.�He may be a little weird, but he is the best Tech they have.�Alone inside the office, Ed quickly dashes to the computer and looks up the current information and location of Luthor's bodyguard Hope.�Finding it, he logs off and turns away from the desk just as the boss reenters.�Ushering Ed out, his Supervisor tells Ed not to try anything else. Lois stands amidst the chaos of Clark's secret hideaway in Suicide Slum. She looks over the articles and clippings hanging from the wall.�She comes across a picture of Luthor with his two bodyguards, and Hope is circled in red.�The door creaks open and Lois turns, expecting to find Clark, but instead Perry walks into the room. Hanging upside down in an elevator shaft, Ed and his boss discuss Ed's fall from position to position until he was finally just maintenance.�Ed says he doesn't mind, what he is doing now is closed to his real interests.�They begin to discuss Superman, when suddenly a cable snaps and his boss starts to fall.�In an instant Ed swings out and catches his supervisor's foot.�He just tells the thankful man that it's his other job. Lois is incredulous that Perry knew about Clark's investigation, and Perry is surprised that Lois didn't know.�Perry tells Lois not to get mad just because she didn't get the story that Hope has gone missing, but Lois tells him that it is something else entirely.�She doesn't deserve to be kept in the dark, by Clark or Perry.�Perry just tells her that sometimes there are things that even those closest don't know. At a deep subbasement, Ed forces a door open and proceeds into the bowels of Lexcorp.�He is suddenly surrounded by a group of killer robots prepared to kill him.�A voice suddenly tells them to deactivate and Ed turns to find Talia Head standing there.�She tells him to stay in his approved areas, or else. Returning upstairs, Ed finds a panicked crowd.�An elevator car is stuck and its supports are beginning to give way. Ed says he'll handle this, and dives into the elevator shaft.�A moment later the car plummets after him. The doomed people in the elevator scream as they plummet downward, and then look around shocked as they begin to slow and then stop.�Below the elevator, Superman, with the shards of his disguise still clinging to him, slowly eases the elevator down to safety. In Clark's office, Perry explains to Lois how Clark got a job at Lexcorp to infiltrate their building. 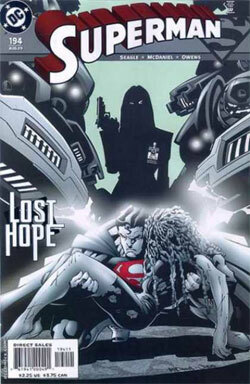 His disguise now gone, Superman speeds to the subbasement and powers through the guard robots.�Tearing into a cell, Superman finds Hope lying on the ground.�Half of her head is shaven and she continues to write "Lex" on every inch of her cell, but Hope nonetheless.�Picking her up, he carries her out of the building. Arriving on the scene, Talia finds the words "I know" burned into the wall of the empty cell. Back in the Planet, Perry congratulates Clark on his story about Hope.�He tells him that he wants him back on staff, but he's going to have to keep it quiet for awhile so he doesn't attract anyone's attention.�Just then Lois walks into the office.�She tells them that she has made a decision.�She is leaving the Planet to work for Channel Three.�Perry and Clark are both shocked, but she just tells them that there are always things even the closest people don't know. Story - 3: This story had a lot of good things.�I like that Clark is finally back with the Planet (although I don't like how it was handled) and I like the idea of an intrigue story.�The suggestion that Talia is trying to bring down Lex was also an interesting twist.�However, there were some things that I definitely didn't like as well.�The whole idea of Clark being able to get a job at Lexcorp is kind of stretching it.�Then there is the fact that Clark has worked there for months?�I'm sorry, but he's Superman.�If he needed to find out where Hope was, there were much better ways to investigate that working there for months.�Finally, there's the little fact that Perry was surprised Lois didn't know about everything, while Perry was the one that told Clark not to tell her.�I just seemed strange to me that Clark would risk his identity so much.�Here Perry knows that Clark is undercover, and 'Ed' lets it be known that he is Superman.�Let's see, that's not too hard to put two and two together.�That could easily give it away to Perry, and maybe even Talia since she is theoretically the one who tipped Clark off.�Overall, it was an interesting concept that could have been handled a lot better.�I praise it for giving us something different, but it just didn't work out as well as it could have. Art - 3: The art was half and half.�Half I liked and half I didn't.�The scene of Superman catching the elevator was great and Ed really looked the part.�But then there is the brief battle scene at the end when you can't even tell what is happening (which is pretty standard for this book of late).�I think I can sum up my dislike for this art with the last panel of the book.�Look at Lois.�I rest my case. Cover Art - 3: The cover represents stuff that happens in the issue, very well.�He's saving Hope from the robots and Talia (although isn't she supposed to be the one who gave him the phone tip?) which I like a lot.�The art is decent too.�However, why did they decide to go with the washed out colors?�It just doesn't look good at all.�I would have given a four if it was colored decently, but as it is it's barely average.